The beloved alumna and former professor returned to campus for a discussion on impact litigation and a private dinner in honor of her 25th anniversary on the Supreme Court. Justice Ruth Bader Ginsburg, who graduated at the top of the Class of 1959 at Columbia Law School and became its first tenured women professor in 1972, returned to campus for a celebration of the 25th anniversary of her investiture to the U.S. Supreme Court. 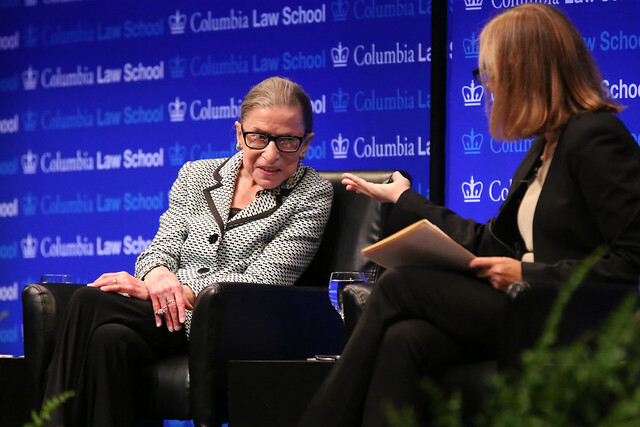 On Friday, September 21, at an afternoon discussion on impact litigation—the strategic process Ginsburg used in the 1970s while teaching at Columbia to bring six landmark anti-discrimination cases before the Supreme Court—she spoke candidly to more than 1,000 students, alumni, faculty, judges, and other guests. Afterward, at a private dinner at Low Memorial Library, she was lionized not only as a trailblazing gender-equality advocate, litigator, scholar, and judge but also as a compassionate colleague, mentor, mother, and friend. For the Columbia community, it was an unforgettable day. At the panel discussion, Ginsburg fielded questions about the confirmation process for Supreme Court justices, the importance of public opinion in equal rights cases, and the future of impact litigation vis-à-vis legislation. 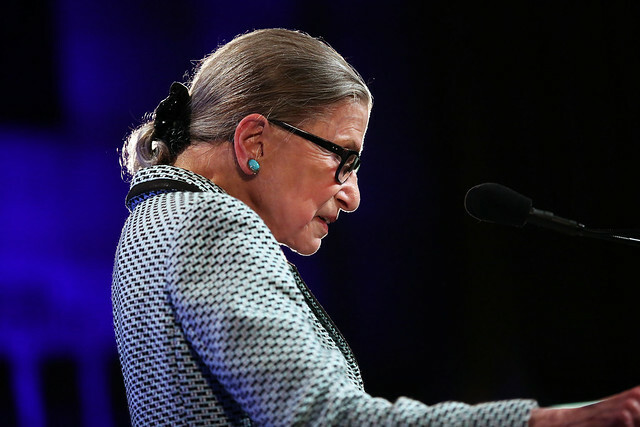 When asked about the most difficult case she had to decide during her years on the Supreme Court, Justice Ginsburg said that all death penalties cause her “tremendous anxiety,” especially the 11th-hour stays. “If I were a queen, there would be no death penalty,” she said, a remark that made news. In her speech at the dinner, the justice paid homage to the six other Columbians who preceded her on the High Court—from John Jay, the first chief justice of the United States, to Associate Justice William O. Douglas, Class of 1925, who sat on the court from 1939 to 1975 and holds the record for longest service. Dean Lester called Ginsburg “my personal hero,” adding Ginsburg has had an “enduring effect” on the Law School community. Each dinner guest received a commemorative book that the Law School produced for the occasion, which featured previously unpublished letters, memos, and photographs from the Columbia archives. Here are more highlights of the historic day. “ This is just the quintessential law school experience. You can see a sitting Supreme Court justice who actually attended your law school,” said Cole Campbell, ’21 (above center), who was among the first in line to get into Lerner Hall for the conversation between Dean Lester and Justice Ginsburg and the panel discussion on impact litigation. Columbia Law Professor Gillian Metzger ’96, who clerked for Ginsburg on the Supreme Court in 1997-1998, moderated the panel discussion on impact litigation. In addition to Ginsburg, the panelists were Lee Gelernt ’88, deputy director of the ACLU Immigrants’ Rights Project, Olatunde Johnson, the Jerome B. Sherman Professor of Law at Columbia Law School, and Nancy Northup ’88, the president and CEO of the Center for Reproductive Rights. In a Q&A with Dean Lester, Ginsburg spoke about her time at Columbia, including the successful campaign she, as a new faculty member, waged against the University in 1972 when it laid off 25 maids but not a single janitor. She also recounted that she landed her first job because Columbia Law School Professor Gerald Gunther persuaded U.S. District Court Judge Edmund Palmieri '29 to hire her as a clerk. “For women of my generation, the challenge was to get that first job because most legal employers wanted no lady lawyer,” said Ginsburg. Ginsburg greeted Columbia University President Emeritus Michael I. Sovern ’55; as Columbia Law School Dean, Sovern appointed her to its faculty. Glazer, a friend of Jane Ginsburg since they were both seven years old, recalled Ginsburg working on briefs in the dining room of her apartment “in a white brick building on East 69th Street that in the 1960s was HQ for a seismic change in our country’s jurisprudence.” She was awed by Jane’s father, Marty, too. “Mr. and Mrs. Ginsburg lived a life of Don Draper glamour and mystery,” said Glazer who clerked for Ginsburg when she was a judge on the U.S. Court of Appeals for the District of Columbia Circuit. To view more photos of the panel and reception, please visit our Flickr or scroll through the galleries below.